i adore bright pinks and this pink called princesses rule! looked especially bright in the bottle and included tons of sparkly crystal shimmer. it is very sheer, which i didn't bother to notice until i got home and my sister put it on her toes, but we instantly fell in love with it anyway. i put three coats on my nails but no worries, it doesn't look heavy at all. still sheer but i don't mind for once! very delicate and lovely. i've heard this kind of polish (similar in type to opi's hollywood blonde and up close and personal) looks good as top layer over blacks or other darker colors so i'll have to try that as well. 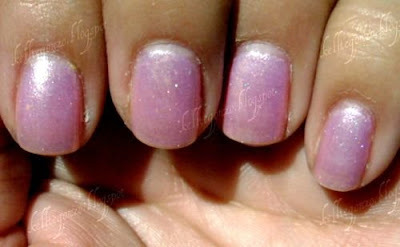 it is a part of the princess charming collection from opi, which i love!